Hello and welcome back for another blog income report! You know how sometimes you just feel burned out? That was me this month. I was completely burned out on the blog. Honestly, I still am but I’m working on ways to get through it. One of the things that has caused some of my burnout is the amount of emails I’ve been getting. I never really got any emails for the blog until this summer. It was very odd timing since I started getting a lot of people reaching out to me right when I had decided to take a break. While the emails are a lot, the opportunities are amazing. I’ve been able to work with so many other amazing bloggers. Since I’m in a burnout, having all of the emails has actually been really helpful because I’ve got so many guest posts. Now I know I need to keep the blog mainly my posts but it’s nice that now I have next month fully scheduled with mainly guest posts. This helped me with my burnout and hopefully I will be out of the burnout after the month is over. Another way I’ve tried to stop the burnout is by adding contributors to the blog. I have not yet posted a contributor post but I’m very excited to start! This month since I was feeling my burnout, I didn’t join any follow threads. Even without the threads, I still saw an increase in following by 117. Not bad! My main increases were on Facebook, Pinterest, and Email Subscribers. I haven’t heard anything back on the EIN number that I applied for last month. They mentioned it would take about 30 days but it has definitely been over that now so we shall see. One of the main focus areas I was going to focus on was Board Booster. I’ve analyzed my stats and realized though that the repins that I do of my pins really aren’t gaining me any traffic. What is though is when other people share my pins. So, I’ve decided to cut back on Board Booster and just use it to share each of my posts twice instead of every three months as I’ve been doing for the past few years. I’m interested to see if there are any changes in traffic with this decrease. It’s so wonderful hearing from other bloggers on what they’ve been up to, what their strategies are, and what goals they’ve set for themselves. 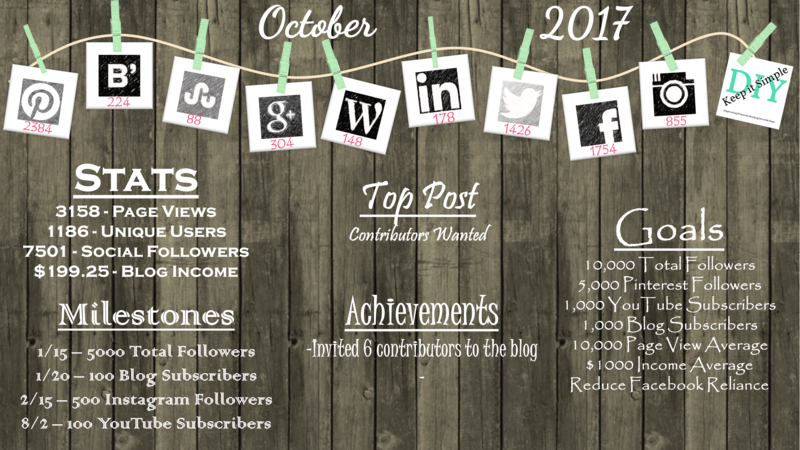 Congratulations on scheduling so many guest posts for the coming month! I love seeing how other bloggers diversify their incomes! So great, congrats! The ad revenue is impressive! Love it.